Comments: In June, 2004 I won an eBay auction for a 1978 Topps Lasorda manager card in a PSA 9. Soon thereafter I decided to go with Mike Schmidt for the 1978 Topps issue so I swapped the Lasorda out for a raw 2003 Topps Archives Fan Favorites card. Its issued post career as a tribute but I thought it was the perfect portrait of Tommy. I sent it off to PSA and it came back in a NM-MT 8 holder. In February, 2010 I upgraded to this PSA 10 after winning another eBay auction from seller Charles Best/dbest-psagems-in-indy. 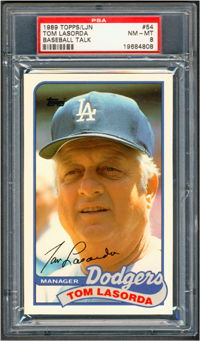 UPDATE: I was playing with the PSA registry on Friday January 10, 2014, adding the newly elected 2014 HOFers, to my set. 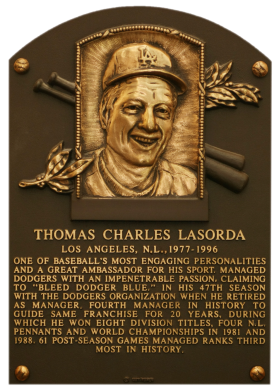 I noticed the Lasorda spot was empty and remembered my card was actually a tribute card - not issued during the manager's career. 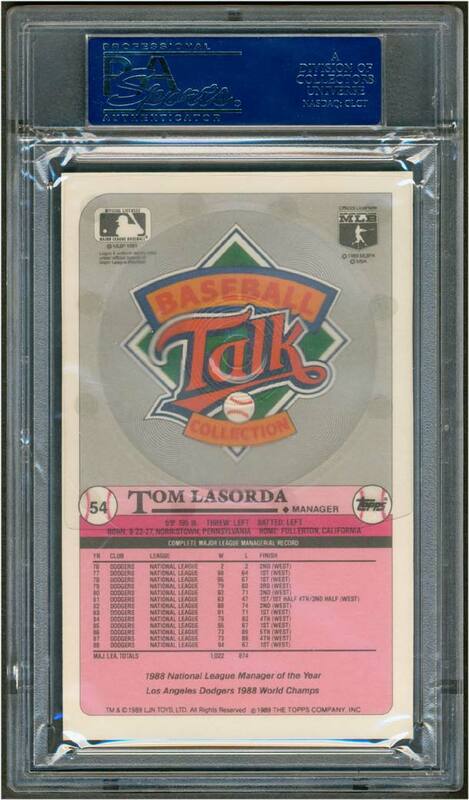 I decided to see what else is out there on eBay and entered a search - "Lasorda PSA". I came across the 1989 Topps/LJN Talk Baseball issue and seller jeffery328311 had a PSA 9 copy on sale for 9.99 and 3.00 S&H. According to the seller it was the highest graded example. I confirmed it by going to the PSA pop reports (no others graded). It was perfect - SOLD! I had never seen the issue before and quickly did another search for "1989 LJN". 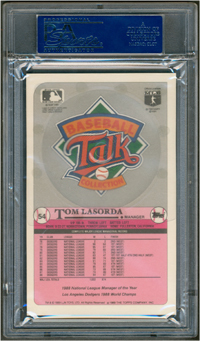 I found a sealed pack (Set #13) with a Lasorda on top for $5 BIN including shipping. Why not? SOLD! I'll post a picture when it arrives. I thought these were just cards. A little later I go on Google and search 1989 Topps LJN and come across this site. This is pretty cool, never heard of this player. I love this card even more now. Now I want to buy a player……about $20 on eBay. Anyway, I'll need to look for more singles/sets to see if I can find a mint raw copy to upgrade my new PSA 8. Anyway, the hunt for an upgrade to my NM-MT copy continues! This blog is a wealth of information about the set.